People often think that I am still a puppy or at least no older than a year or two. They are surprised to discover that I am almost 7 years old. To me, that's just as young as can be, however in dog years, it can mean that a pet starts to slow down. Mommy has always sought to keep me in the best health she can, so she has tried various vitamin and mineral supplements, she has me on probiotics that are incorporated in my meals and she makes sure I exercise (which means play time for me). 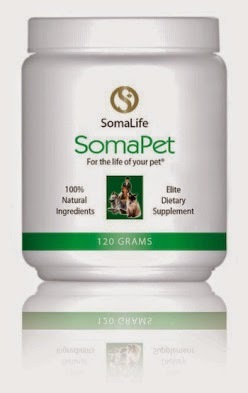 Recently, we were asked to try a special high quality supplement called SomaPet, an all natural, vegan whole food supplement specifically designed to jump start your pet's natural ability to repair and regenerate cells. How does it do that you ask? Through the special dietary blend of 8 amino acids which are the building blocks of protein. 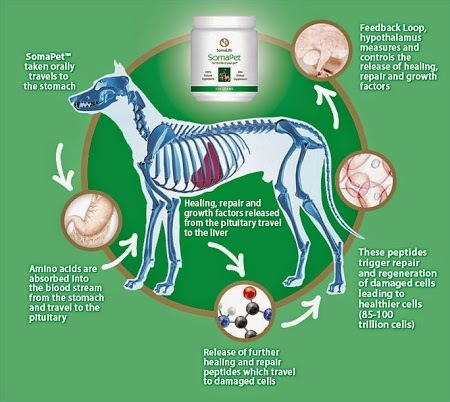 These amino acids, which are the only ingredients in SomaPet, are designed to work together to improve the overall health of your pet, especially ones who are over the age of 3 and might be showing any signs of aging or slowing down. SomaPet was created by Dr. Dr. Philip White developed SomaPet after noticing his pet German Shepherd, Rover, struggling up stairs as he aged. Dr. White had already created SomaLife for humans and realized his beloved Rover could benefit from a supplement just like it. Hence the inspiration for SomaPet was born. I love eating, so whenever it's time to eat for me, I "drop" whatever I'm doing and come running. 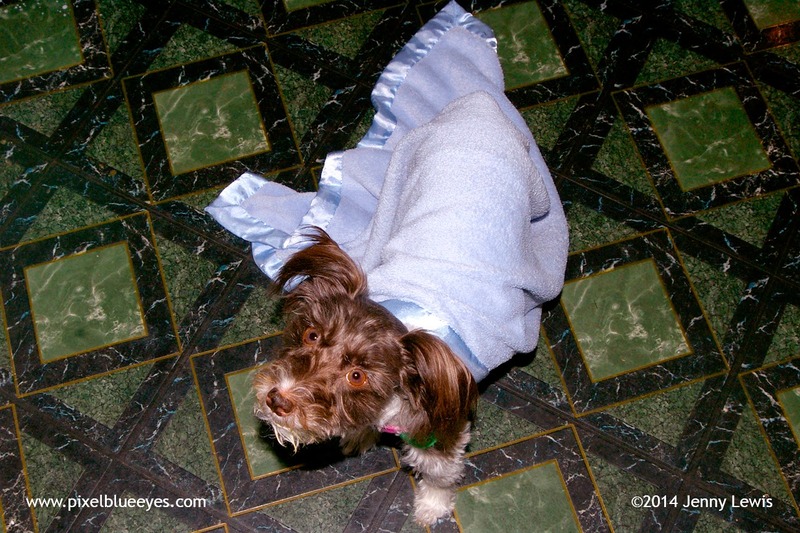 Sometimes, if I am sleeping and the "clink" of my food bowl on the counter occurs, I run in so fast I carry my blanket with me! 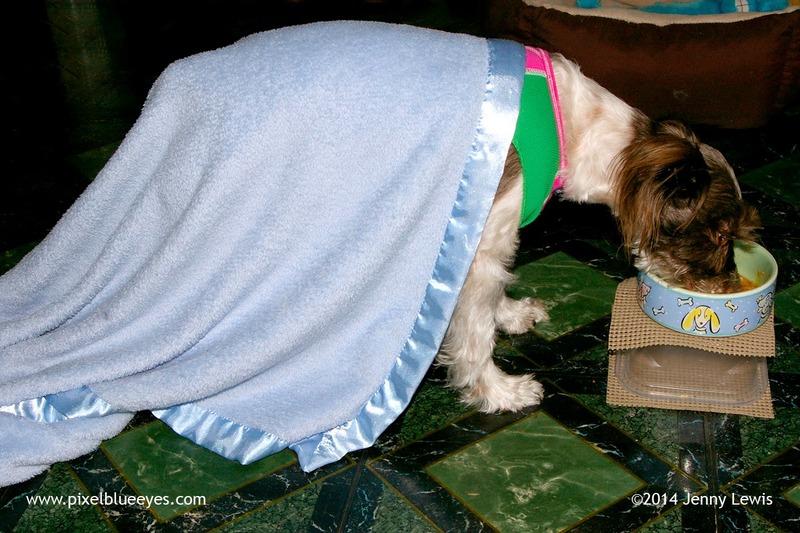 It doesn't matter what I'm wearing, the SomaPet supplement and my food tastes great! The instructions said to give a dog that weighs up to 50 pounds one scoop a day, but because I'm only 11 pounds, we started with half that and then built up to the full dose. The SomaPet supplement tasted fine to me mixed in with my cooked chicken, rice & veggies. It is such a fine powder that I'm sure it would blend with anything. One thing Mommy noticed with me specifically is that my skin seemed healthier. I have issues sometimes with my thin, pink skin, and often with the skin near and on my tail nub, but having the proper blend of vital amino acids seems to make it healthier with less itchiness. Mommy's been very pleased. But don't just take my word for it. Many other pets have tried it too with amazing results! It has given new life to dogs much older than me with crippling arthritis, and cats who had all but given up on being able to run around chasing a laser pointer anymore. Remember that SomaPet is made up of ONLY the finest amino acids, which are the building blocks of protein. To learn more about it or try some yourself, visit their website (you may need Flash to view website) and shopping page, both of which has a wealth of information including ingredients and testimonials. 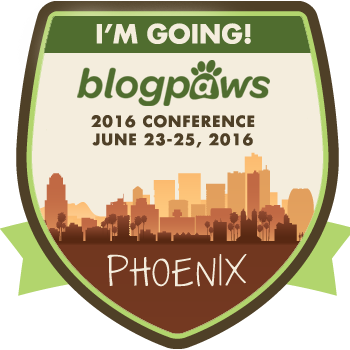 for a huge #BlogPawsChat on Aug 5 from 8:00 PM – 10:00PM EST. They will be giving away bottles of SomaPet!! I'd love to see you there friends! 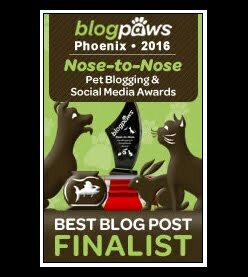 This post is sponsored by SomaPet and the BlogPaws Professional Pet Blogger Network. I am being compensated for helping spread the word about SomaPet, but Pixel Blue Eyes only shares information we feel is relevant to our readers. SomaPet is not responsible for the content of this article. Sounds like a great product. Do you know if it will work on allergy on a German Shephard. I think if it possible eventuel can downsize the itching in the fur? That is great that it has made you itches better as well. Sounds like a good product for you. Have a marvellous Monday Pixel. 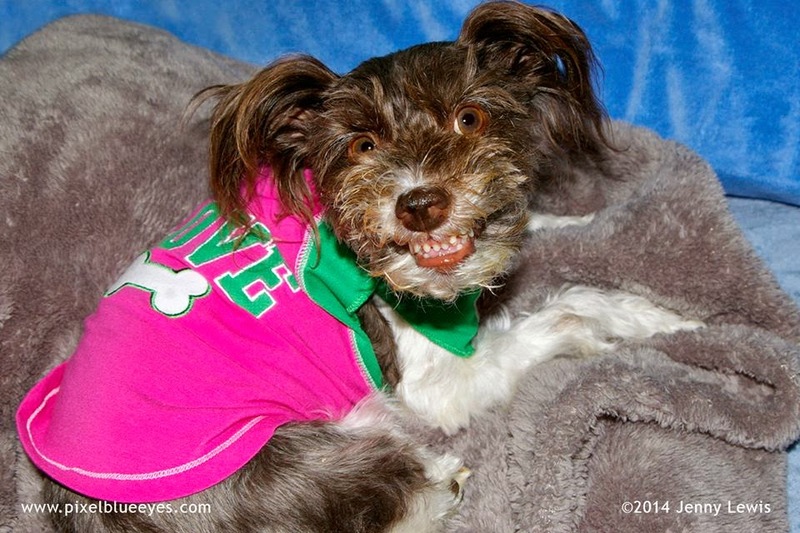 Wow Pixel you have turned into a real advertisment for dog health. Hope all is well with you. The reason everyone thinks you are a puppy is because you are so cute. I am 10 1/2 years old and I agree about the slowing down part.